Ocho Palmas is truly a jewel of a Caribbean villa. This enchanting four-bedroom, four bathroom luxury villa with sprawling decks and private infinity pool commands a paradisiacal view of the Caribbean. Located at the Western most tip of the Roatan in Lighthouse Estates. Imagine your friends and family basking in the Caribbean sunshine listening to the sea lapping against the backyard while you float in the private infinity pool. The colorfully lush tropical vegetation is a haven for butterflies and hummingbirds while fishing and dive boats occasionally meander by. Facing East, sunrise from the expansive pillared veranda is a daily marvel. The beautiful décor and attention to details in Ocho Palmas sets it far above other houses. The beautiful fabrics, handcrafted Honduran furniture and artwork make you feel at home…all the comforts of home in a carefree Caribbean Adventure! This luxurious four-bedroom, four-bathroom home offers both indoor and outdoor living. 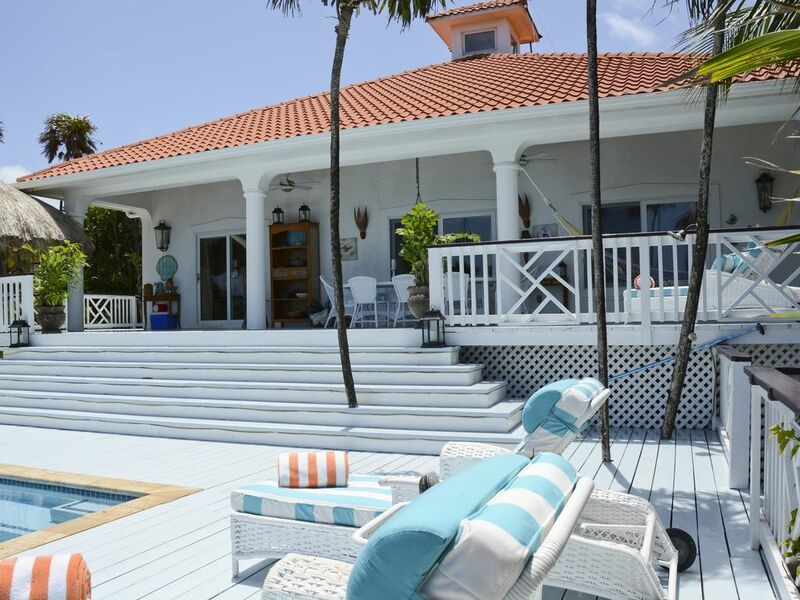 This oceanfront Villa is located on the South side iron shore of West Bay with a great private beach just a moments stroll from the house (about 100 yards). Smugglers bar/restaurant is located on the other half of the private beach, giving you the option of relaxing at the perfect small, friendly beach bar or secluded private beach. Experience beautiful sunset views whilst sipping a cold drink as the sun drops into the Western Caribbean. From here West Bay Beach is less than a 5 minute walk where you'll find a variety of restaurants and bars and shopping. Airport transfer to the house included. Our property managers will greet you when you arrive to West Bay, they are available for helping book tours and activities or simply answering any questions about the home or the island in general. Having an Island cook come to your house and prepare a delicious feast of traditional cuisine is a treat. All of the shopping and cleanup is included. Another must is swimming with the dolphins at Anthony's Key. Suggestion: make your reservation at the beginning of your visit, as it it very popular. The jungle vegetation is spectacular and there is no better way to experience this than sailing through them on a zip line, all within minutes of your house. The main house and upper level of the deck is wheelchair accessible. The pool deck is not. Ocho Palmas is conveniently located on the Western most tip of Roatan Island. The very first house on the South Shore of West Bay, closest to the Lighthouse Point beach in a private community. West Bay Beach is just 5 minutes walk, here you will find the tourist hub of Roatan with Resorts, bars, restaurants, dive centres and many water activities. Less than a 30 minute drive to Roatan International airport makes Ocho Palmas an easy and idyllic getaway. Golf: The Black Pearl (Pete Dye) Golf Course. New-first 18 hole course with Clubhouse and Restaurant and Bar. Breathtaking views. *Accidental Damage Protection. This plan is automatically included in your rental at a cost of $49. It provides protection against accidental damage that is promptly reported to your rental manager up to the amount of $500. In cases where the damage is more than $500, Island House has the right to claim on the damage deposit for any such overage. *Prices listed are for 8 person occupancy *Rates do not include 19% Honduran taxes *Discounts available for a couple Note: Until confirmed, rates are subject to change without notice.